In The Shining Way I presented in outline the way of salvation that true religion sponsors and promotes. Not all religions, but true religion. That qualification allowed me to make a critical distinction between religion-in-essence or religion-itself, and the sometimes pathological forms it can take when it gets hijacked by that most dangerous force in all the universe – our neurotic ego. Right now, each and every religion is either tracking with or departing from the Shining Way, which is our guiding path into deeper meaning, greater joy, and higher wholeness as human beings. Throughout its history a given religion will trace a meandering line: coming closer, trending with, crossing over, or veering away from genuine community and our higher nature. These days, it happens that the major traditions of name-brand religion are rapidly losing relevance and credibility, sliding into complacency, bigotry or terrorism, and ramping the enthusiasm of members for a final escape – an end-time deliverance out of this world. When we identify religion-itself with its pathological deformities, we make two very serious mistakes. First, as just mentioned, we forfeit our chance to better understand the role and function of healthy religion in our evolving spirituality as human beings. By throwing out the baby with the toxic bathwater, we lose the ability to ground our existence and orient our lives inside a system of values and aspirations that can lift us into our higher nature. The second mistake is even more critical, since it lies at the roots of the first one: In our effort to break away from religion and leave it in the past, we miss an opportunity for honest self-examination, which is also our chance for the liberation our souls truly desire. This is not liberation as in deliverance or escape, but liberation as in being set free to become whole again. With our adventure into a separate center of self-conscious personal identity, we fell out of the unconscious oneness of our first nature (i.e., our living body). 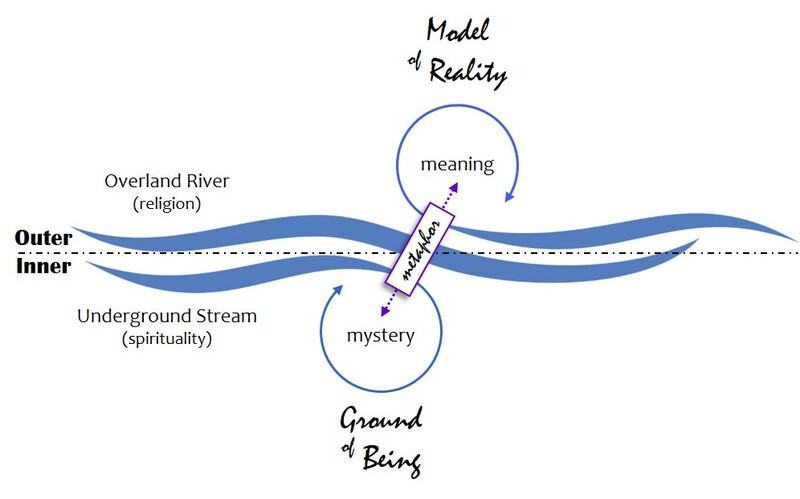 As the myths and wisdom traditions across cultures attest, our ensuing psychospiritual journey is about dying to the self we’ve been duped into believing we are, waking up from the trance of our separateness (which also means our specialness and self-importance), and rising into the fullness of what we are as human beings. 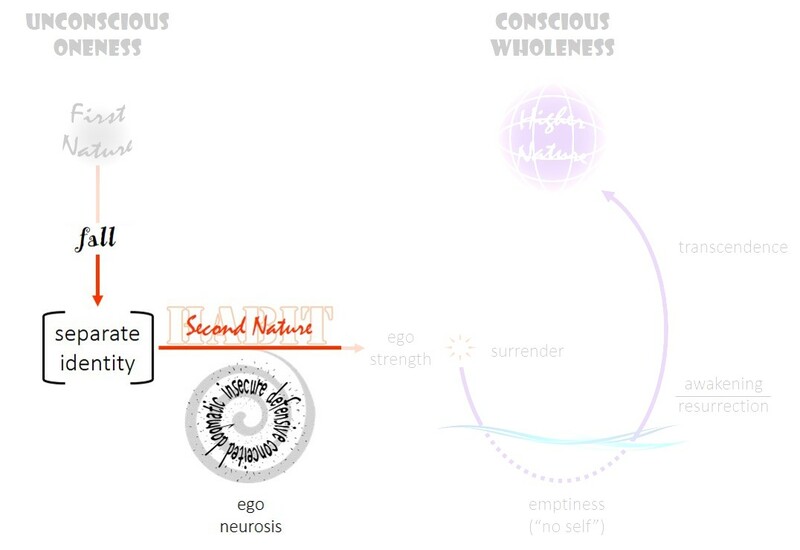 For this to happen we must surrender our center of personal identity (aka ego or second nature) and go beyond ourselves – not negate, renounce, or cancel out the ego, but rather to leap from its stable base into a conscious wholeness where body and soul, self and other, human and nature are affirmed in their unity. The stability of this base is a key precondition of our self-transcendence, for without it the thrust of our leap will only push our feet deeper into the muck of ego neurosis. In this post my task is to reach into the muck in order to uncover and examine what’s got us stuck, which I’m hoping will also crack the code of what makes a religion pathological. Certainly, the early and widespread interest of primitive religion in the postmortem was a very natural extension of human curiosity and imagination. What had been a breathing, moving, and vibrant individual the day before is now lying motionless and cold before us. What happened? Where did that animating life-force go? Because it was also so intimately connected with the unique personality of that individual, it wasn’t a terrible strain on logic to assume that it may have relocated elsewhere. For millenniums ancient peoples envisioned a place where the departed spirits of their friends, relatives, and ancestors (why not their pets and other animals?) continued in some kind of existence. With the rise of theism and ego consciousness, however, a moral obsession over the dualism of right and wrong inspired a division in this shadowland of the afterlife. Now, depending on one’s station in life (e.g., landowner or peasant), or whether they were sinner or saint, a departed spirit – which was becoming more like a ghostly version of the individual’s former identity (ego) – would be punished or rewarded accordingly. This dualism in the very nature of reality served to orient and motivate the moral compliance of members, and thus to enforce the social order. It was also during this stage in the evolution of religion (theism) that patron deities were imagined in roles of lawgiver, supervisor, judge, advocate, or disciplinarian. In the reciprocity of obedience and worship for a deity’s blessing and protection, devotees had a ‘higher reason’ to remain dutifully in their assigned ranks. One thing we need to remember as we consider this emergence of the self-conscious ego is how its separation from the enveloping realities of the womb, the nursing bond, and the primal family circle brings with it some degree of insecurity. The fall into greater exposure and self-conscious vulnerability prompts the individual to seek attachment, where he will early on find safety, warmth, and nourishment; and later the acceptance, recognition, and approval he needs to belong. Attachment, that is to say, compensates for and hopefully resolves the insecurity which inevitably comes along with ego formation. Because insecurity is registered in the nervous system as restlessness and anxiety, one way of managing it – particularly if positive attachment objects are unavailable – is by dissociating from the body. It is common for victims of child abuse, for instance, to seek escape where physical flight isn’t an option, by ‘walling off’ the violated part of themselves, even engaging in a fantasy of existing apart from their bodies. This dissociated self then becomes ‘my true self’, ‘who I am’ as separate from the pain and suffering the individual is forced to endure. A consequence of dissociation is that the personality lacks the stable support of a coherent nervous state, and stability is a foundational virtue of ego strength. Now, before you conclude that I’m making a causal connection between pathological religion and priests who were abused as children, hold on. The fact is that each of us is insecure in our unique degree, and that, further, all of us without exception have sought refuge outside and apart from our bodies. A good number of us entertain fantasies of living on without the pain and drag of an embodied life, as bloodless souls in heaven after we die. Perhaps a majority of us have grown so estranged from our animal nature, that we try to suppress the body’s messaging system (called ‘symptoms’) through a variety of distractions, intoxicants, and medications. And we all tend to lock ourselves up inside convictions that keep us from having to be fully present in the moment – present in our pain, present to one another, or present with whatever challenge is at hand. The homeless ego, dissociated from our first nature, has hijacked religion and is steering it like a jetliner for the far horizon of this life, as far as possible from the mess we’re in, but tragically also away from the present mystery of reality.